Lolly is the first portable 3D recording device that gives listeners an immersive feeling. Our three dimensional sound makes it seem like you’re hearing the music live! Lolly is compact and portable so you can easily slip it in your pocket. It’s also very user-friendly. You don’t have to be an audio engineer to have professional quality! Lolly connects to an iPhone thru the phone’s Lightning port, so there’s no dongles or adapters to worry about if you’re using the microphone with a newer iPhone model. Lolly also works seamlessly with all iOS-based media production apps, including GarageBand, Instagram, Snapchat, Facebook, and Voice Memos. Lolly is set to be released in the next few days. Follow the link at the top of this post to sign up for release announcements and more information on the Lolly microphone. Electronic media gathering in remote locations has become increasingly easier in recent years, mainly due to the versatility of mobile smart devices. Unlike a simple camera or digital audio recorder, a smart device can run apps that allow it to become a fully functional production studio. But most of these devices aren’t equipped with professional-level microphones. Equipment manufacturers have stepped in to bridge that gap. The latest to do so is Rode with the announcement of its i-XLR Lightning adapter that works with iOS devices. 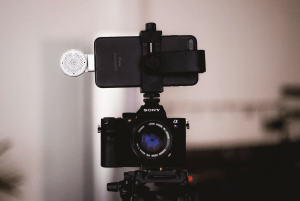 The i-XLR connects any microphone to a Lightning-enabled iOS device using a three-meter long shielded audio cable. Having a cable this long allows the user to easily store their iOS device in a pocket or bag while having the mic out and ready to use. The i-XLR comes with a built-in headphone output for live monitoring and the device carries an additional 20db of input gain which is especially handy for use with dynamic microphones. The i-XLR also has a built-in record button as well as LED’s that show the record/pause status of a recording while being used with compatible audio apps. The i-XLR is expected to ship later this year. Pricing has not yet been determined.